Yemen: "No one should have to get used to the sound of airstrikes"
Two months into the conflict in Yemen, Médecins Sans Frontières/Doctors Without Borders (MSF) teams are providing humanitarian aid and medical care to people living near the frontlines who are in desperate need of help. In Taiz, the country’s third city and home to 1.2 million people, an MSF team is providing local hospitals with support, medical supplies and drugs. 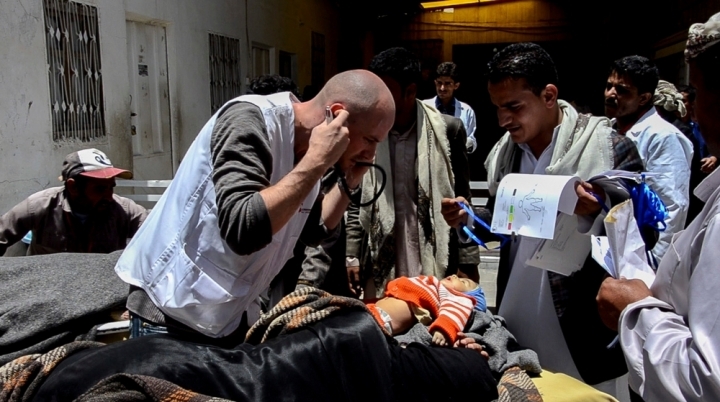 Dr Ahmad Bilal, MSF’s medical coordinator in Yemen, describes the situation. “The situation in Taiz is extremely tense, with fighting continuing between different armed groups. You can hear the sound of heavy mortars falling, and airstrikes hitting different parts of the city continuously. In the past few days, the airstrikes and tank shelling have intensified. The attacks might be targeted at military strategic goals, but they are claiming lots of civilian victims. Because of the ongoing fighting and bombing, many people near frontline areas of the city are moving to neighbourhoods that are safer – or at least they are moving women and children out of direct danger. Others are leaving Taiz completely. Most of the city’s inhabitants came originally from villages in the governorate, so many are either going back to their villages or else to relatively safe areas such as Ibb governorate, south of Sana’a. An MSF doctor examines a young patient during a mass casualty inside casued by a bus accident in Khamer, 260 miles north of Taiz. A couple of days ago, on 26 May, a fuel tanker in the city was shelled. In the hours that followed, 184 people were admitted to hospital with severe burns injuries – 115 to Al-Thawra hospital and 69 to Yemen International hospital. We heard that more than 15 people died due to the explosion. As one of the few aid organisations in Taiz, we were asked to help provide medical supplies. As our team arrived at Al Thawra hospital, a mortar landed nearby and our staff had to run to the basement and shelter there until the shelling had eased. Luckily it did not affect the hospital itself. So far we have donated three ‘burn kits’ with medical material to treat people with severe burns and 200 bags of IV fluids to the hospitals in Taiz, and we’ll provide them with drugs as soon as we can get more supplies into the area. Because of the conflict, it can take some time to get medical supplies and teams into frontline areas. The lack of fuel is a real issue – both for our teams and for local people, making it difficult to transport patients and medical supplies. Yemen imports 90 percent of its food and fuel, but commercial ships are struggling to dock. IDPs from the marginalized community in Khamer town, Yemen. These IDPs fled their home due to heavy airstrikes in Sa'ada. They lack food and proper shelter. For ordinary people it means that it is hard to move around the city and it’s an ongoing struggle to access clean water and food. Many people living in frontline areas are unable to travel to clinics or hospitals for medical care both because of the fighting and the lack of fuel. Even those who are able to make it to health facilities, find that they are not functioning. At least 12 hospitals in Taiz had to close their doors and stop receiving patients, for these reasons. War is an abnormal situation – no one should have to get used to the sound of bullets and airstrikes. But after a couple of months in the country, we and the civilians are unfortunately getting used to it. People try to avoid frontline areas, but the problem is that fighting can start up unexpectedly, and shelling is extremely unpredictable. It is sometimes frustrating to be here because the needs are so high and the amount of assistance provided is so low in comparison to what is needed. Despite the numerous logistical and security challenges, MSF teams continue to deliver medical assistance to people in Yemen. MSF medical staff have treated more than 1,700 war-wounded patients in Yemen since 19 March. 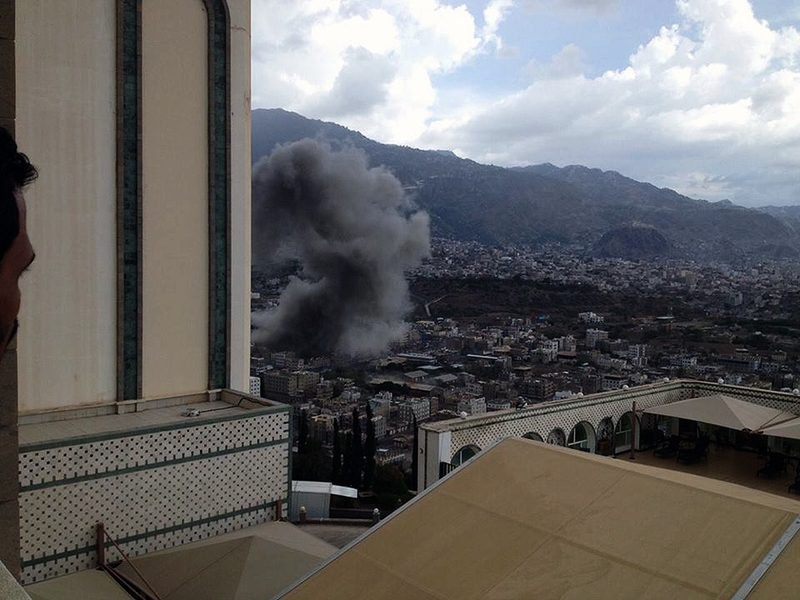 MSF is currently working in Sana’a, Aden, Ad-Dhale, Amran, Taiz and Hajjah governorates.